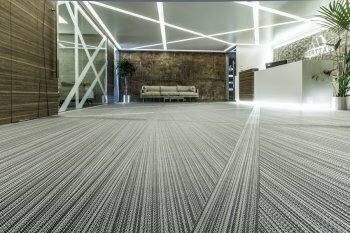 Woven vinyl flooring is a modern floor covering with the highest parameters, as well as an innovative and awe-inspiring design, enjoying great interest in the commercial and private sectors. Woven vinyl floor coverings are characterized by their modern texture imitating fabric. The vinyl yarn supported by a fiberglass core is woven on jacquard looms and finished with homogeneous vinyl underlays making the flooring very durable and resistant to wear.